Increasing popularity of homeopathy for eczema as best natural treatment must have definitely made you wonder and explore it more. 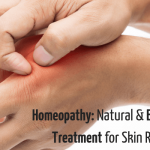 Here in this article, I will try my best to explain why natural treatment like homeopathy is superior to conventional pharma and how you can also get benefits from the same for your eczema condition. When the immune system becomes hyperactive it may create an inflammatory effect over the skin leading to dryness, itchiness, and redness causing a skin condition known as Eczema or allergic dermatitis. 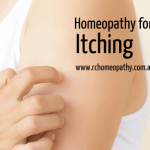 Eczema is not contagious but continuous rubbing can make the symptoms worse. This skin condition is more common in babies than in adults and may show up on chin, cheeks, neck, and scalp. Although it self-heals itself as the child grows older but sometimes it may even carry over to their adulthood and makes treatment mandatory. Some adults who haven’t faced this skin condition in childhood may also develop it either due to genetic predisposition or continuous exposure to allergens. Having either one or both the parents having some of the autoimmune disorder such as Eczema, hay fever or asthma increases its probability manifold. Other than genetic history, certain environments triggers which aggravate the symptoms should be paid attention to. These include microbes, allergens, irritants, weather sensitivity, certain foods, and stress. You can also keep a diary or a journal to keep track of the triggers specific to you. Conventional treatments come with steroids, antihistamines, immunomodulators, calcineurin inhibitors and cortico steroid tablets. 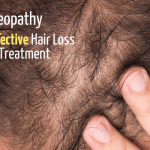 These treatments can only provide a temporary relief only to become more potent in future. The medicines can further harm other organs and degrades the overall health. Above that it starts affecting the patient psyche and breaking him down emotionally and mentally. Also, new treatments such as immunosuppressive drugs are increasingly getting popular as a new mode of treatment but their efficacy and consequences in long run have still not put under research light. Essentially, these treatments are effective only to the extent where a patient takes them on a continuous basis. These symptoms can flare up back again when one stop their intake if root cause is not treated. Certain ointments and creams used under the conventional mode also tend to harm the skin on continuous usage and may even lead to skin thinning. But now the question that resonates much is the fact “Can conventional treatments really provide an independence against Eczema? If you prefer to use these treatments for children, the use of emollients, creams, and bandages can be annoying and can affect their mental and emotional health adversely. Instead their growing age requires a complete healing treatment. Now comes the power of natural treatment modalities which not only manages the outer symptoms but also try to raise the body’s inner healing potential. This is why treatments like homeopathy while raising your immunity levels, may for some time aggravate the symptoms since the healing takes place from inside out. Be assured that this turbulence inside your body system is completely natural and is a part of treatment. It is your body getting out of balance for some time to recalibrate your inner vital force back for your own inner healing power to come to action. 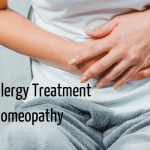 Upon consultation with a homeopath doctor, you can expect questions pertaining your family history, what allergens trigger these symptoms, what specific traumas happened just before you’d developed this condition, previous medical history and so on. There are specific remedies for every eczema trigger you have. If it’s around the joint bends, Natrum Mur is recommended. For dryness, Graphites is the top homeopathic remedy. For itchiness, Psorinum and sulphur are the best. Note: Consult a homeopath before taking the above remedies. An experienced homeopathic doctor will prescribe you with the best suitable remedy, frequency and the improvisations as your healing progresses. If you still have any doubts leave me a message at info@RChomeopathy.com.au and I will get back to you soon.